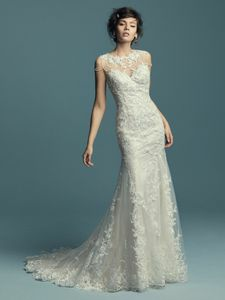 Description: This vintage-inspired wedding dress features a unique neckline of beaded lines and lace motifs along the illusion jewel neckline and illusion back. Soft fit-and-flare silhouette features embroidered lace motifs atop tulle. Finished with covered buttons over zipper closure.